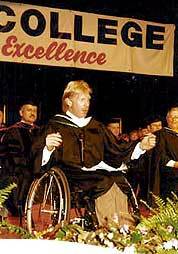 Kevin Saunders established the Wheelchair Success Foundation (WSF) in 1990. He did so out of a desire to create something that would benefit others, now and in the future. It was because of the way he was raised. While growing up on a farm in Downs, Kansas, Kevin was taught how it's more important to give than to receive, and to treat others as you would like to be treated. Following his injury, Kevin embraced the turning point of his life and forged ahead. He realized who he was and where he wanted to go. He learned to develop strategies and set goals to achieve his dreams. He became a world champion wheelchair athlete and top inspirational, motivational speaker, author and actor. But another dream was to establish the WSF, Kevin wanted to help others who are permanently confined to wheelchairs be full participants in the game of life. Kevin wants to encourage and help wheelchair bound individuals receive college degrees or learn technical trades. As Kevin says, "I know it is sometimes difficult and there are challenges and obstacles. Even people on their feet who have problems for various reasons want to give up. But other people with all kinds of disabilities and challenges have made it and so can you. It's hard to make the time to go to school and find time to study, but I encourage anyone to go in spite of all of the obstacles because you will better yourself and have fun." Through the WSF, Kevin hopes to create a far-reaching ripple effect of positive results for those permanently confined to wheelchairs. He hopes to empower their lives and help them become thrilling contributors, rather than dependents of this great country. He wants to motivate wheelchair-bound individuals to take action, apply for a scholarship and reach their peak performance levels as they earn an advanced education. Visit our Donate Online section, because it truly is better to give than to receive. Contribute to the WSF today and make a positive difference in another person's life. Gold, Silver and Bronze award levels are available for companies and people who donate to this worthy cause. To recognize them for corporate, business and individuals for their outstanding generosity, sculptures are given to recognize them for their outstanding generosity. The Coastal Bend Community Foundation of Corpus Christi, Texas manages the Wheelchair Success Foundation. Kevin Saunders chose the Coastal Bend Community Foundation as the custodian of the scholarship due to its integrity, stability and ability to serve the needs of the donors. Coastal Bend administers the contributions, awards, and scholarships, as funds are available. The Coastal Bend Community Foundation is a 501(c)(3) non-profit charity. Contributions to the Wheelchair Success Fund are fully tax-deductible. On April 7, 1981, in Corpus Christi, Texas, Kevin Saunders was performing a grain elevator inspection when an explosion occurred. It threw him 300 feet through the air and slammed his body onto a concrete parking lot. Ten of his co-workers died. With a fractured skull, collapsed lungs, and massive internal and external injuries, doctors didn't think he would live. He survived, but is a paraplegic. Little did he know it was the beginning of a second, blessed life. Through sheer will and a determination to succeed, he turned tragedy into triumph. He became a world champion wheelchair athlete, and was the first person in our nation's history appointed to the President's Council on Physical Fitness & Sports by President George H. Bush. He was the only member reappointed by President William Clinton. Kevin became a popular star of numerous television commercials promoting fitness and education. He also became one of the top inspirational and motivational speakers in the country. His book, "There's Always A Way" chronicles his life and includes a foreword written by President George H. Bush. Kevin also created the first-ever action wheelchair hero comic book series, "Chairman." Today, he is a much sought-after inspirational, motivational speaker and a popular writer for fitness and personal excellence publications. "Thanks to God, I got a second chance in life. God wasn't finished with me. I got a chance to not only make a positive difference in my own life, but also in the lives of others."